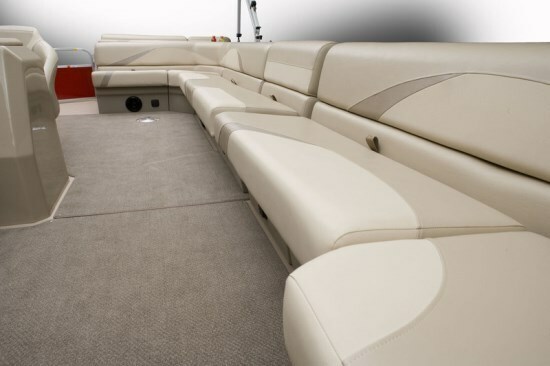 For 2013, G3 Boats of Lebanon, Missouri, a Yamaha Marine Company, offers thirty models of SunCatcher pontoon boats in three series, V, X, and Elite, from sixteen to over twenty-six feet in length. G3 also offers an additional, are you ready, eighty-four models of Mod-V and Deep-V aluminum fishing boats and Jon boats. That’s a total of one hundred and fourteen models! And all powered by Yamaha outboards of course. In G3’s words, “The new SunCatcher V Series™ models have graceful exterior design, combined with classy and comfortable interiors to provide affordable on-water luxury. Luxury is now affordable with the new SunCatcher V22 Cruise. The spacious 8' 6" deck has over 22' of full-length usable space.” It will now be obvious that the “C” in the model designation represents “Cruise,” and the difference between the V22C and the V322C is two logs (pontoons) versus three. Even though the two models above the deck may seem identical in size, layout and features, the additional log in the V322C, subject of this review, makes quite a difference in the specifications of the two boats. To begin with, the pontoon aluminum gauge (thickness) on all three pontoons increases from .080 on the two log model V22C to .100 on the V322C and doubles in gauge on the nosecones from .100 to .200. Pontoon (log) size remains unchanged at 23” x 25” but the resultant hull weight increases from 2100 lbs. to 2580 lbs. with the third pontoon. Perhaps one of the most obvious advantages of the third pontoon is the increase in carrying capacity from 2200 to 2400 pounds, or from eleven to twelve persons. Maximum allowable horsepower also increases from 115 to 150 with the third log with a corresponding increase in fuel tank capacity from 27 to 38 (US) gallons. Base horsepower for the V322C is 90 versus 40 for the V22C. 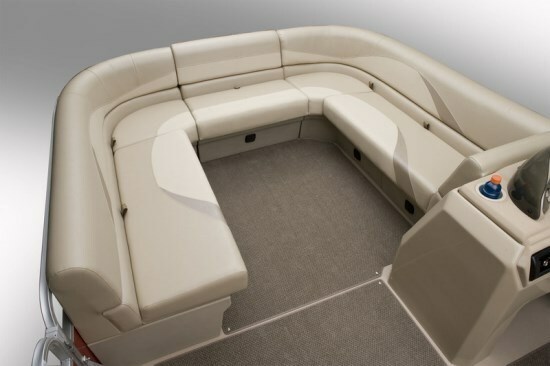 The interior of both models include separate port and starboard forward 3-seater bench/loungers with an optionally available removable filler cushion section where the centre bow gate is located to allow these two bench/loungers to join together to become a full U-shaped forward seating arrangement. 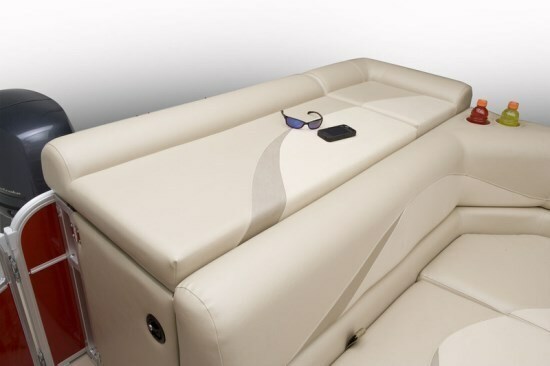 Three-section storage is located below the cushions of each of these bench/loungers. Port aft seating is provided by a large L-shaped lounge with four sections of storage below. A port side removable filler seat located in front of the port side gate connects this lounge with the forward port bench/lounge to create a huge lounge from the starboard transom gate right around and forward on the port side to the bow. With the bow filler section in place as well, virtually the entire inner perimeter of the V322C is seating save for the helm console and the small section behind it on the starboard side. 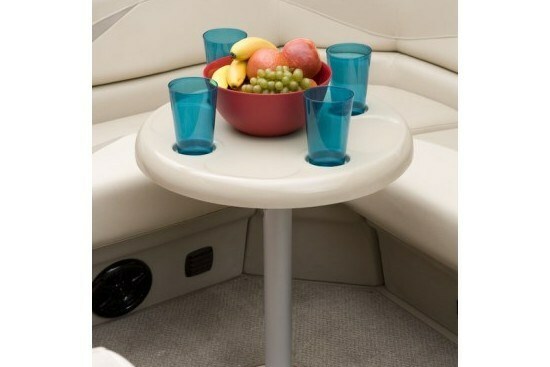 Mounted in front of the “L” of the rear lounge is a standard circular ABS composite table with four molded-in drink holders. Across the port side of the transom and behind the L-shaped lounge is a cushioned SunCatcher tanning deck which doubles as a huge storage area or, with the top flipped up, becomes a full-length optionally available privacy enclosure. A four-step stern-mounted boarding ladder is also standard. 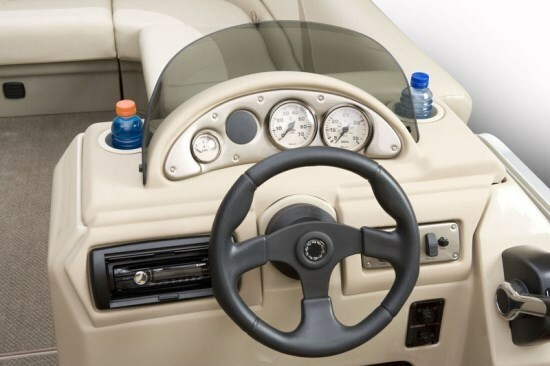 A “new style” swivel helm bucket seat serves the captain at the fibreglass reinforced console which comes standard with a molded tinted plexiglass windscreen and a colour-coordinated dash panel complete with Faria® fog-resistant gauges including speedometer, tachometer, and fuel. A 12-volt accessory outlet is standard along with the console-mounted Sony AM/FM/CD stereo with retractable cover, USB port, and Sony speakers. Standard floor covering is vinyl over the marine grade pressure treated plywood deck with limited lifetime warranty. Sectional snap-in carpeting is optionally available. 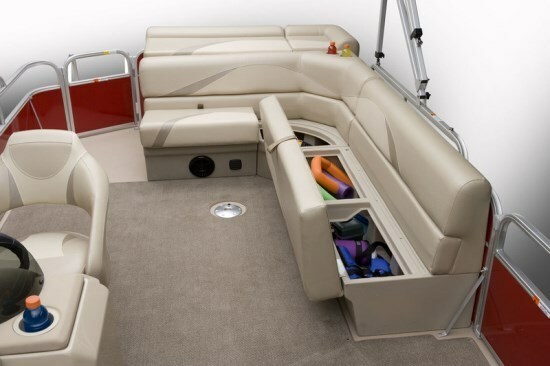 Floor level courtesy lighting is standard as is a contoured bimini top with quick-release support arms. If you’re in the market for a pontoon boat between sixteen and twenty-six feet, with thirty models from which to choose, SunCatcher likely has one just right for you.